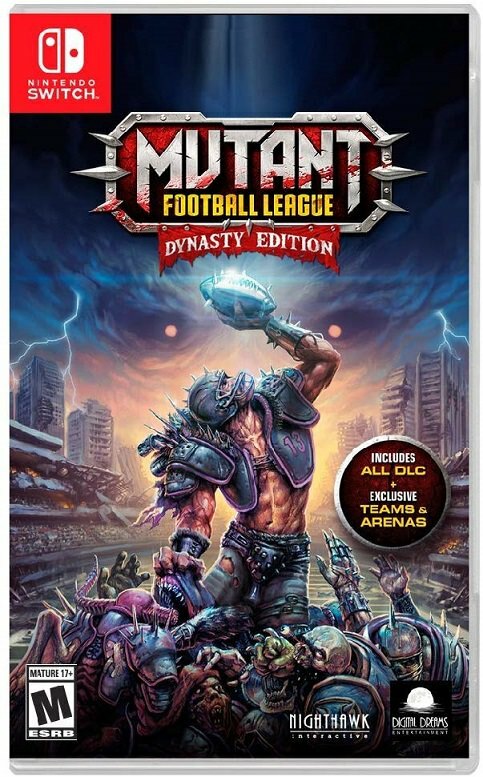 After 25 years we finally have a spiritual successor to Mutant League Football! Like many from my generation, I spent way too much time in the 90’s in front of my Sega Genesis with Mutant League Football, a game that asked “What if we take EA’s Madden, replace all the guys with monsters and allow them to kill each other in the field?” and turned it into one of the most unique and fun sports titles of that generation. 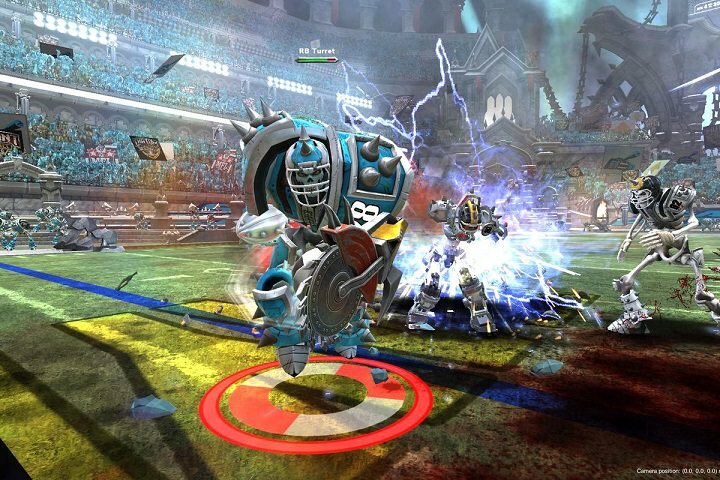 Mutant Football League (sounds the same but it’s not, see what they did there?) comes with big expectations since one of the original designers of the classic 90’s game is involved in this one. In some respects it surpasses those expectations while falling short in others. The gameplay is a very lose 7 on 7 rendition of football that plays fast and is easy to pick-up and play, not unlike NFL Blitz. I spent literally five minutes with the game before everything became second nature, so even beginners will have a blast. The only difference from a traditional football game is the level of violence (and that we have monsters instead of humans in the field). You see, it is very possible (and highly encouraged!) to kill your opponents. Every player has a health bar and the insane hits, attacks and hazards that player is subjected to will lower said health bar. When it reaches zero, the player dies and needs to be replaced. It is not uncommon to see all the players in your team replaced during a game, so you better have some good backups! You can land dirty hits after the play ends like in NFL Blitz. Also the stadiums are littered with hazards, ranging from saws to a giant woman who can eat players in one gulp. 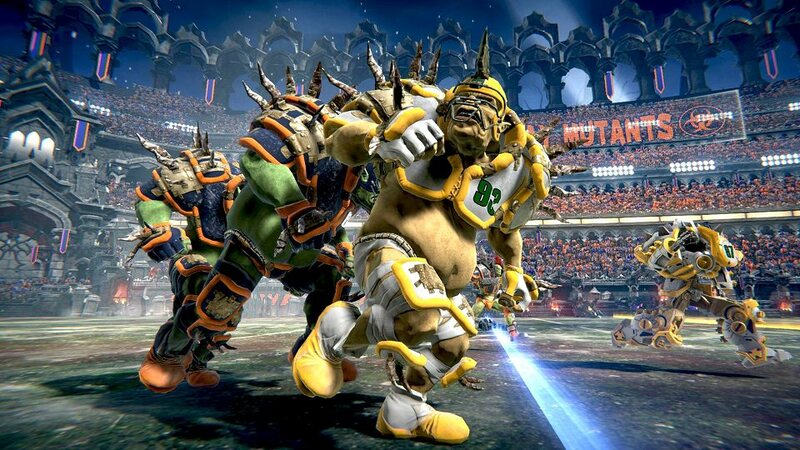 In Mutant Football League, death is the name of the game. You can also call plays like in any decent football game, but the playbook is short and sweet like in NFL Blitz. Don’t expect a playbook dozens of pages deep that allows you to unleash your inner Vince Lombardi. The game and the action is fast and furious. You also have a limited set of “dirty tricks” you can execute per half. These range from brining the referee to turning one of your players into an unstoppable giant. While the idea is novel and fits the concept of the game, it can be game-breaking and frustrating. There is nothing worse than being in a close, down to the wire game and losing because the CPU used a dirty trick at that point. It feels very Mario Kart-like in that sense and the CPU tends to pull the come-from-behind thing way too often. For example, in one of my first games as I was learning the systems I was down by 4 with 16 seconds on the clock. I throw a deep bomb and score the winning touchdown, start celebrating and…..the CPU uses the time warp dirty trick and erases the play. I lost. I have had similar situations happen dozens of times. The CPU is very inconsistent with this as well since I have seen them used dirty tricks unnecessarily (such as in games were I have blown them out already and it makes no difference) while in other instances in which it makes sense and they could beat me with it they don’t use it. Admittedly, when you are the one executing the dirty trick successfully is fun (such as having your giant LB intercept a surefire touchdown pass) but it is never feels fun or fair when you are on the other side of it. This is especially true in multiplayer as some of my friends have gotten so angry that they have refused to play again. Combine this with the natural hazards that appear during gameplay (ranging from chainsaws to holes in the ground) and the potential for something going awfully wrong are multiplied. Granted, the same was true of the 16-bit classic that inspired it, but it doesn’t make it any less frustrating. Eventually, all the cheap tricks are fun but there has to be more meat of them bones. The Nintendo Switch version includes all the DLC from the PC version and adds a surprisingly fun and deep Dynasty Mode. You start with 40 scrubs and have to build an elite team over multiple years. Everything you expect in a traditional game is here, like trades and free agency and there is even a skeleton of a story mode that ties it all together and changes depending on your success (or lack thereof). 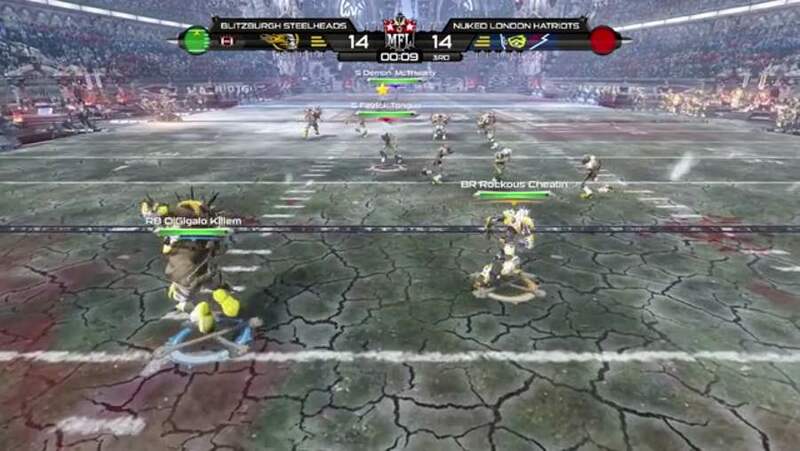 Teams and most players are based on real-life teams and players, so expect to see the likes of Bomb Shady (Tom Brady) and Airborne Dodgers (Aaron Rodgers). Also spoofs on some NFL legends will periodically show as free agents. I came away suitably impressed as the mode was much better and deeper than I expected from this game. It is not quite Madden deep, but much deeper than I expected for a pick-up and play arcade football game. The game’s graphics are Ok, but look much better with the Switch docked. This is not the most impressive game ever, but it is a ton of fun seeing some of these monsters in 3D after using our imaginations in the 16-bit days. There is a lot of detail and the explosions and gore are suitably memorable. The frame rate surprisingly holds up even when there is a ton of chaos on the screen. However, I noticed some jagged polygons here and there which were more noticeable in handheld mode. Handheld mode’s visuals also look grainier than docked and I felt like there were way too many things on my limited field of vision. This is one of those games that perform better docked. The sound is suitable for the game, including the commentary which is full of witticisms and dark humor. They have a style very similar to the commentary of NBA Jam or NFL Blitz which is fantastic for this type of game. Although it eventually becomes repetitive over the course of the long season it remains one of the game’s pluses.The sound effects for explosions and screams of pain are well done and so are the crowd noises. The music is generic but fits the vibe of the game. 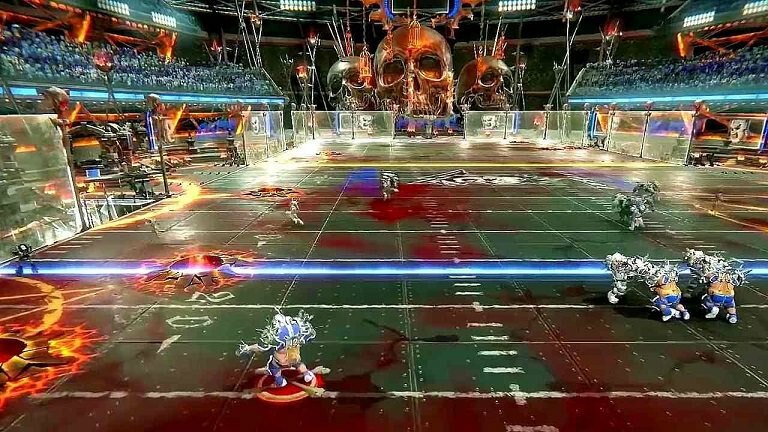 As the only American football game on the Switch, Mutant Football League: Dynasty Edition is serviceable, but not an adequate replacement for Madden (not that it intends to be). The surprisingly deep Dynasty Mode and the insanely fun (and funny) violence are major pluses, but the game can get repetitive and frustrating over the long haul. It clearly needs some improvements and refinements but it has a solid base that I hope is improved upon and not discarded. I had a lot of fun with this one and if we get a better sequel that corrects some of the mistakes of this one (better balancing, ability to turn off hazards if you want etc) we finally might have a challenger to Madden for best football game.